Is it Safe to Ski During Pregnancy? Home > Health & Lifestyle > Is it Safe to Ski During Pregnancy? Advice from midwives and doctors is varied when it comes to the subject of skiing during pregnancy. With no firm consensus, expectant mothers with a passion for skiing should weigh up the pros and cons. So, what are the potential risks associated with skiing when pregnant, just how serious are they and how can they be reduced? Skiing is a relatively active sport, where the risk of falls is high. Even experienced skiers fall from time to time and landing on an icy spot can be particularly dangerous. A particularly serious fall, a worst case scenario, could lead to premature delivery as a result of placental abruption – the tearing away of the placenta from the wall of the uterus. As a pregnancy progresses, a woman usually experiences changes in her centre of gravity, making skiing later in pregnancy more risky. 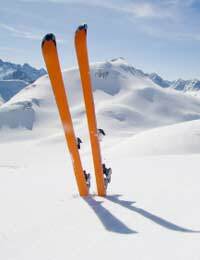 Changes in weight distribution associated with pregnancy could also disorientate a pregnant skier. Whilst a fall could have serious repercussions for the health of a pregnant mother and her child, it is important to remember that a baby is well cushioned and protected by the amniotic fluid that surrounds it in the womb. It is usually only in extreme accidents or as a result of major trauma that babies are harmed. Whilst there is a risk to the foetus in contact and impact sports, skiers and their babies do not face such severe risks. Skiers usually move in a slight squatting position, meaning that there is little pressure on the abdomen. Plenty of skiers continue to follow their passion for snow sports whilst pregnant and accidents are few and far between. With a little forethought, consideration and careful planning, the risks associated with skiing during pregnancy can be reduced. Firstly, pregnant women should try to ski midweek, when the slopes are less crowded and there are fewer people about to bump into. Pregnant skiers should stick to easier runs, avoiding expert slopes. Take things slow and enjoy the relaxing pace. If you find yourself itching increase your pace, stop. Give skiing a rest during the latter half of your second trimester and during your third trimester, as this is when your centre of balance will begin to shift. Deciding whether to ski or not during pregnancy can be tough. Most importantly, the conclusion you come to should be personal to you, reflecting the health history of both you and your baby, as well as your levels of skiing competence and confidence. Take time to discuss the matter with your doctor or midwife and, if you do choose to hit the slopes, be sure to devise a strategy that will foster the safety of you and your unborn child. Remember that there’s no shame in taking a break. Sipping a hot drink in a slope-side bar can be just as gratifying as perfecting the latest stunts. Bear in mind, too, that you have years of skiing ahead of you and there will be plenty of time for you to pass on your passion to your children.